Grey Pneumatic 30-Piece 1/2 in. 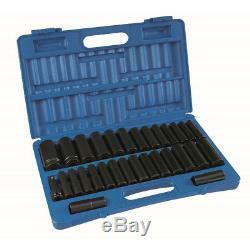 Drive SAE/Metric Deep Socket Set. Deep Length Flip - 2146DT. Drive 19mm 21mm Deep Length Flip Impact - 2192DT. Length Friction Ball Extension - 2243E. Deep Length Impact Socket - 2014D. Deep Length Impact Socket - 2016D. Deep Length Impact Socket - 2018D. Deep Length Impact Socket - 2020D. Deep Length Impact Socket - 2022D. Deep Length Impact Socket - 2024D. Deep Length Impact Socket - 2026D. Deep Length Impact Socket - 2028D. Deep Length Impact Socket - 2030D. Deep Length Impact Socket - 2032D. Deep Length Impact Socket - 2034D. Deep Length Impact Socket - 2036D. Deep Length Impact Socket - 2040D. Drive 10mm Deep Length Impact Socket - 2010MD. Drive 11mm Deep Length Impact Socket - 2011MD. Drive 12mm Deep Length Impact Socket - 2012MD. Drive 13mm Deep Length Impact Socket - 2013MD. Drive 14mm Deep Length Impact Socket - 2014MD. Drive 15mm Deep Length Impact Socket - 2015MD. Drive 16mm Deep Length Impact Socket - 2016MD. Drive 17mm Deep Length Impact Socket - 2017MD. Drive 18mm Deep Length Impact Socket - 2018MD. Drive 19mm Deep Length Impact Socket - 2019MD. Drive 20mm Deep Length Impact Socket - 2020MD. Drive 21mm Deep Length Impact Socket - 2021MD. Drive 22mm Deep Length Impact Socket - 2022MD. Drive 23mm Deep Length Impact Socket - 2023MD. Drive 24mm Deep Length Impact Socket - 2024MD. Drive 25mm Deep Length Impact Socket - 2025MD. Drive 26mm Deep Length Impact Socket - 2026MD. Drive 27mm Deep Length Impact Socket - 2027MD. High quality alloy steel (chrome-molybdenum) construction with exact heat treatment ensures the correct balance of strength and durability. High torque drive provides increased strength through the transfer of pressure from the thinnest part of the socket wall toward the thicker section. A reduction in wall thickness increases socket's capability of being used in tight areas. Sockets grip the fastener across a broader contact area, reducing the chance of rounding off fasteners. Molded case with handle allows easy storage and convenience while working. 10 - 27mm / 7/16 in. WHY OUR CUSTOMERS KEEP SHOPPING WITH US. SECURE & HASSLE FREE SHOPPING. We are available 7 days a week. All corded products are designed to work with North American 110/120V outlets only. The item "Grey Pneumatic 1/2 in. 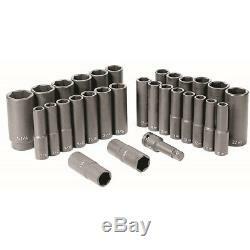 SAE and Metric Deep Socket Set 1512DM New" is in sale since Monday, January 8, 2018. This item is in the category "Home & Garden\Tools & Workshop Equipment\Air Tools\Ratchets & Wrenches". The seller is "cpo-outlets" and is located in Suwanee, Georgia. This item can be shipped to United States. Socket Length: 10 - 27mm / 7/16 in.